A couple Apple employees just walked down the line and gave everybody in line a bottle of water. Great customer service - check out Seth Godin's blog for more on how little things like this make a big difference to how consumers view a company. Interestingly, Apple's partner on the iPhone has almost the opposite reputation for customer service - maybe they'll learn something. Well I'm in line at the Apple store at the Short Hills Mall in Short Hills NJ. Figured this would be a good spot - sorta low key, upscale mall. I got here about 3:30 (store doesn't open until 6) figuring I would check out the line, grab a bite to eat and get back in line. I was stunned to see the line already snaking around velvet ropes inside. I asked one of the many policemen where the end of the line was - outside he said. So here I am outside - waiting for the iPhone. I'd estimate they're somewhere between 150 and 200 people alrady here - hard to say, but based on this sampling, gotta think this thing is gonna sell like crazy. All for now - will check in later. Boy these guys are fast! 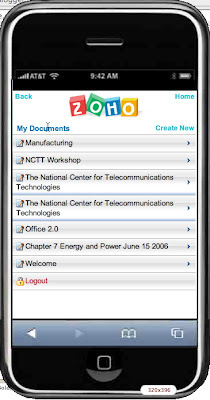 Zoho today launched www.iZoho.com a version of their online office suite for the highly anticipated Apple iPhone. Here's a couple screen shots showing iZoho in action. 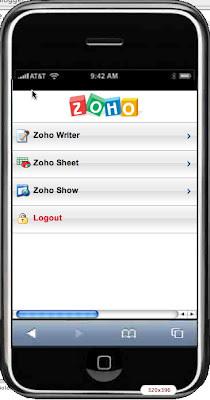 These are live screens from my Zoho account - running within an iPhone simulator. As you can see, I can access Writer, Sheet and Show files - equivalents for Word, Excel and Powerpoint. Pretty cool stuff! Can't wait to see it on a real iPhone. Is this Mobile_Office 2.0? it's amazing the richness that they're [virtual worlds] trying to convey ... but it's frustrating that we're still trying to control that through the thin straw of a mouse and keyboard interface. Richard Ziade has a great post at Basement.org called 10 Things We Can Learn From Apple. The focus is primarily on Apple as a business and their approach to design. What I've done below is to take the "10 Things" and apply them to my business - education. Understand The Total Experience. This one is really critical in education, particularly when you consider recruitment and retention. We need to realize that interaction with a student does not start when they enter a classroom or end when they walk out the door. So often, each part of a college acts as it's own little silo - independent of anything else happening at the college. A college isn't about registration, classes, financial aid and graduation - it's about how all of the pieces work together to create a total experience. By taking a holistic approach, ignoring separations and focusing on solving real problems in a cohesive way, we have an opportunity to re-make our market. Less Is More. This, I think, is all about simplicity. Whether it's registering for classes, getting to class, or grabbing a bite to eat - we have to work hard to make things simple. It's seems counter-intuitive, but the harder we work - the simpler things get. "He's Got His Father's Eyes." In Ziade's post, this has more to do with similarity of design between iPods, Macs, and remotes - when you see an Apple product, you recognize it as part of the Apple family. In education, this is about consistency, in the classroom, outside the classroom and everywhere in between. "I'd Like To Introduce You To Some...Thing." This is all about personalization - Apple let's people sign up for email updates. Many of these emails begin "I'd Like To Introduce You To ..." There's no reason why an educational institution shouldn't be able to communicate with students - prospective, current and past - and make them feel like they are special; an individual - the singular focus of our attention. Control The Hardware. Unlike a Windows PC [Dell, HP, Gateway, etc], only Apple makes Apple computers. Because they control the hardware, they know exactly how their operating system and software will behave on that hardware. This to me is about quality control. Don't misunderstand me - it's not about controlling faculty, it's about providing faculty with the support and resources they need to be successful. What does that mean? Maybe we hire less adjuncts or more adjuncts; provide more professional development, mentoring or or even reduce teaching loads. There is no one answer to this, but in the end - better faculty make better students. If you're having difficulty staffing a class, does it do more harm to the institution to cancel the class or to staff it with an unqualified instructor? Hide The Screws. If you pick up an iPod or other Apple product, it's difficult to figure out how it's put together - the screws (i.e. the ugliness of technology) are hidden. The same should be true at a college - all the messiness and behind the scenes stuff that makes a college run should be hidden from the end-users or as we call them the students. "Go Ahead. Touch It." Have you ever been to an Apple store? They're amazing places! All the products are out in the open waiting for someone to try them out, get comfortable with them and experience them. Do we make it easy for students to explore - courses, programs, even lectures that might spark their interest? How about an open house with brief lectures by some of your best faculty and an opportunity to interact with them afterwards. Don't even get me started on the Genius Bar - What if every college had a Genius Bar? Feeling & Thinking. Humans are inherently social beings. It's important to engage them intellectually, but also socially and emotionally. This ensures a stronger connection with students and better integration into the college community. Apple, with their products, has been able to tap into their user's emotions. Most college have student life activities that move in this direction, but couldn't we do more in the classroom? Great Design = New Invention. Apple has great (not just good) designs that have re-defined whole markets - consider mp3 players. In education, if we focus on good or good enough - that's what we get back. If instead we strive to be great we have an opportunity to be great. To quote Arthur Schopenhauer - "Talent hits a target no one else can hit; Genius hits a target no one else can see." It's About People. If we re-write this as It's About Students - this could become a guiding mantra for education - an over-arching theme that permeates everything we do. Everything - from the design of the website, and the college catalog to the classrooms and open spaces - reinforces this commitment to the student. In a previous post - Gapminder: Re-Thinking How We Visualize Data, we detail the work of Hans Rosling, a professor of global health at Sweden’s Karolinska Institute. Here is his follow up presentation at TED 2007 (March '07). Tryout the Gapminder tool yourself, but I don't suggest you try the show stopper he ends with. Wireless Power - Time to Cut the Cord! Have you ever been at the airport with a laptop - searching around your gate for a seat within reach of a power outlet? I have - at airports, colleges, coffee shops and hotel lobbies. While ubiquitous wireless networks have become a productivity boon to business travelers, the lack of sufficient battery life and sources of power quickly . Even when you do find an available outlet, you're vying for it with a half dozen other road-warriors , resulting in a messy tangle of power cords. Fortunately, some very bright people at MIT are working on a solution they call - WiTricity. Read more about it here - MIT Harnesses Power Without Plugs. 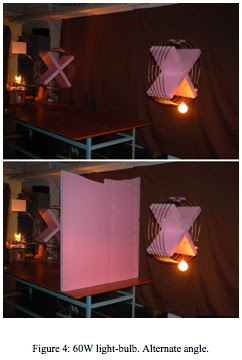 Summarizing, MIT physics professor Marin Soljacic and colleagues were able to light a 60 Watt bulb from 7 feet away - without wires! The device isn't ready for prime time, being only 40 to 45 percent efficient and way too big (2-ft diameter copper coils) to be practical and portable. For you Electrical Engineers, here is the abstract of the original paper and a photo of the power transmitter in action, from the magazine Science. 1 Department of Physics, Massachusetts Institute of Technology, Cambridge, MA 02139, USA. 2 Department of Electrical Engineering and Computer Science, Massachusetts Institute of Technology, Cambridge, MA 02139, USA. 3 Department of Physics and Laboratory for Nuclear Science, Massachusetts Institute of Technology, Cambridge, MA 02139, USA. Using self-resonant coils in a strongly coupled regime, we experimentally demonstrate efficient non-radiative power transfer over distances of up to eight times the radius of the coils. We demonstrate the ability to transfer 60W with approximately 40% efficiency over distances in excess of two meters. We present a quantitative model describing the power transfer which matches the experimental results to within 5%. We discuss practical applicability and suggest directions for further studies. In a recent presentation on Active Learning with colleague Norah Kerr-McCurry (Director of the College's Teaching and Learning Center), we talked about Online 2.0 and the need to integrate Web 2.0 tools (blogs, podcasts, wikis, RSS, social networking, etc) into our online courses and transform faculty into Faculty 2.0. In e-learning 2.0: All You Need To Know, Richard MacManus (Read/WriteWeb) provides a great overview that further builds on these ideas. He cites a very comprehensive post by Steve O'Hear that characterizes traditional e-learning as cumbersome, expensive and structured around courses, timetables, and testing. Fundamentally, driven by institutional needs rather than the needs of the individual learner. a 'small pieces, loosely joined' approach that combines the use of discrete but complementary tools and web services - such as blogs, wikis, and other social software - to support the creation of ad-hoc learning communities. The recurring theme seems to be about empowering the individual learner and helping learners form a community. As a classroom instructor this is a daunting task, because it means giving up control. Already we're finding that control is elusive, as Web 2.0 has empowered our students and begun to undermine the traditional command-and-control hierarchy of academia. Faculty need to embrace these new technologies, form their own communities, empower their students and discover their Faculty 2.0.
adding presentation sharing and collaboration capabilities to Google Docs & Spreadsheets sometime this summer. Tonic has developed technology for presentation creation and document conversion and Zenter software for creating online slide presentations. Expect some sleepless nights in Redmond. Richard MacManus founder and editor of the Read/WriteWeb (Aside: Web 2.0 has also been referred to as the Read/Write Web) blog has a great article comparing the major web-based office suites. A defining criterion for being considered an office suite is inclusion of traditional office apps: email, calendar, word processing, spreadsheets, and presentations. 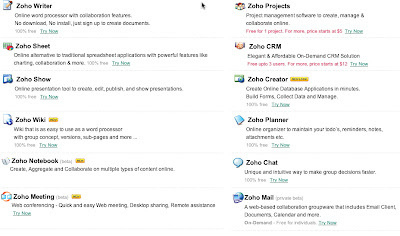 Interestingly, small players Zoho and Zimbra have the most complete offerings. Zoho, in particular has a pretty extensive list of offerings - listen to the first interview below to learn how having a number of small web-based apps speeds up the development process when compared to a large monolithic desktop office suite. 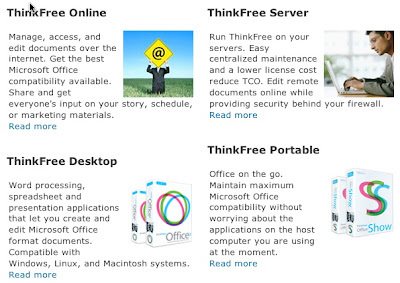 ThinkFree has the core office applications (Word, Excel, Powerpoint), but no Calendar or Email, but is one of the few to offer some offline capabilities and a portable version. Google is missing applications for online presentations and meetings, but has made some recent acquisitions that should fill these holes. Surprisingly - maybe - Microsoft is the farthest behind, although McManus seems to think that Microsoft will never offer a fully online suite, instead opting for a desktop/online hybrid to try and protect one of their cash cows. Lastly, the current market "leaders" Zoho and Google and their numerous web-based offerings are compared. I think many miss the power and potential of these online office suites. Some see these as free or low-cost alternatives to Microsoft Office, but where these online suites will really we disruptive is in empowering unprecedented mass collaboration. As Zoho CEO Sridhar Vembu and Evangelist Raju Vegesna say - collaboration is the killer app! Zoho, disruptor of Microsoft Office? It will be interesting to see how successful this strategy is for Apple. One of the biggest complaints about the soon to be released Apple iPhone - is the lack of a SDK or Software Developers Kit. An SDK would provide software developers with the tools to create applications for the iPhone. Steve Jobs has been very careful to keep the iPhone a closed system - citing concerns about 3rd party applications causing iPhone instability and network issues. At the World Wide Developers Conference, last week in San Francisco, Jobs announced a new and risky strategy that would keep the system closed, yet allow developers to create iPhone applications. Because the iPhone has a full-fledged version of the Safari web browser, Jobs and Apple are promoting the use of web-based apps - Web 2.0 - on the iPhone. If this works, it will become a brilliant strategy that empowers average Web 2.0 citizens to become Apple developers. If it fails - Apple may need to think about opening up the iPhone and releasing a true SDK. With two weeks left until the iPhone launch - here are some tantalizing web-based apps already created for the iPhone - in less than a week! To try them out yourself, visit the links after the video. Here's another great video from our friends at CommonCraft - the folks who helped us understand RSS. As before, this video uses a really imaginative presentation style to explain a somewhat elusive concept - this time wikis - in just under four minutes. If you're familiar with Wikipedia, then you've seen a wiki, but you might not be aware of what a great collaboration tool wikis are. In the flattened web 2.0 world, collaboration is the killer app. I encourage you to watch the video, visit any of the sites listed below, create a wiki, invite your friends and colleagues and begin collaborating. To learn more about wikis visit - you guessed it - wikipedia.